I am due to have a BT engineer visit tomorrow to enable my AA broadband for a new property I've just moved into (all be it has taken 6 weeks from order date to line install date for this to happen, due to BT Openreach being so busy - I find that quite outrageous, but I guess that's the way things work with BT at the moment). Anyway, my last ADSL based ISP was BE, around 3 years ago now. They don't have a BRAS, so there was no issue of the line sync speed dropping due to forced disconnects/restarts of the modem as there is with a BT connection. I'd also like to point out that I'm using a SpeedTouch modem bridged through to a Linux box, so the modem sync and the actual PPP connection are managed by completely different units (eg. I can fire the modem up, let it sync, and control the PPP session independently). So, I'm looking for some advice. I presume that the training period for the BRAS is still present on 21CN connections (just like 20CN) and that it spans 10 or so days. So I'm guessing I shouldn't do anything which will unexpectedly terminate the PPP session as that will upset the BRAS. If I do wish to disconnect, I should bring down the PPP interface in a controlled way first (graceful termination). Is that a safe assumption? Or is the BRAS also basing it's line diagnostics on the modem line sync, and how many re-syncs occur during a specific time period? PPP won't upset BRAS it's only a series of resync events that will have any bearing on that you can drop and reconnect PPP as many times as you like. Great thanks. I'll make sure, once the modem is fired up and synced, to leave it well alone. Well all seems to be working like a charm, after a firmware upgrade was required from version 6 to version 7 on my SpeedTouch (version 6 caused it lock up once the ADSL synced up, very strange). Cooking on gas with native IPv6 too. So far, AA looks to be -the- best ISP have used so far (even better than Zen). Funny how Zen, on their site, link to the compare ISP page on TTB and intentionally miss out including AA as a comparison to make them look like they come out on top. If you actually add AA in, it's a completely different story. Thank you, AA, for an extremely smooth broadband install ! How are you finding the slower speed? A&A is by far the best ISP bar none, but I had to leave as BT systematically destroyed my line to the point where it was unusable for ADSL. I moved to VM and I'm on 50Mb and (touch wood) I've had a faultless service. I'm moving shortly to a non VM area with another [censored] line - I'm going to miss the speed, but at least I get lots of nice things to play with again, like IP blocks, IPv6 and decent support should I need it. Well, to be honest, it's a bit of a downer. Not that I'm a heavy downloader or anything, but it was nice to download stuff quickly when I wanted it rather than having to wait longer for it to complete. My BRAS just jumped yesterday from 11Mb to 12Mbs so now I'm on about 11Mbps downstream. I've done speed tests during the day, and during 'peak' periods (like evenings/weekends), there is a noticeable slowdown in speed, but I'm putting that down to 21CN congestion on BT's backhaul network. And it's what I expect to be honest, from a 21CN based connection. The upload speed is also a drop. Strangely enough (and maybe someone else can explain this), I was syncing at about 1.1Mbs upstream. But during training (and now having forced interleaving to be turned ON per my portal request), that has now sunk and stuck to 888 kps. I'm not too fussed, just a bit uncertain as to what's going on there as I'm sure the line can go a bit higher than that. As far as A&A go, they are probably the best provider I have joined to date. Their portals are very raw looking, but functional beyond belief. The IPv6 is brilliant (I have bridged my modem to a Linux router, so got all that working perfectly). And the flat rate line rental is also a bonus. 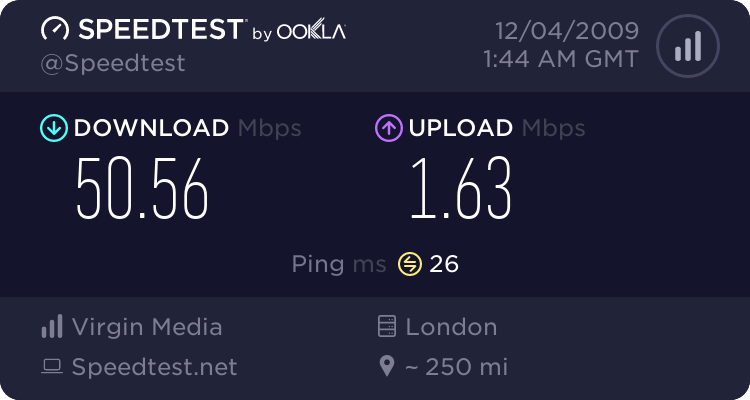 I think the best bit of all is completely removing BT from the equation, as far as having to deal with them in anyway verbally or bill wise - I pay A&A for both the line rental + broadband in one single bill, and if there is any fault on the line, I can just go direct to A&A and have them deal with it. I'm pretty pleased about that. Fibre is due to arrive with me in about 3 to 4 months. Not to sure about it yet, considering it will cost more, and I'll have to purchase a new VDSL router and re-think how I wire my new place up since BT insist on re-shaping the master socket, which is where you then connect the VDSL router to. That upsets my internal wiring within the flat so I may have to go the home-plug route to get my internal network to my network devices in various rooms. But I shall cross that bridge if and when I come to it. A VDSL modem is provided for you via Openreach (you must use this, not your own, at present), just plug it into your existing router via its "WAN" port. You may be able to configure one of standard LAN ports to become a WAN port if it is an ADSL modem/router. Oh right, that's news to me. So does BT's VDSL router act a bit like a Virgin cable modem then? That is, it has a standard ethernet port and what ever you plug onto that, you just configure the connected device to auto configure its interface via DHCP ? If that's the case, this then begs the question of how IPv6 becomes useable on an A&A connection which has that enabled. At this rate, I may well wait until I'm allowed to use my own kit. The modem is just there for VDSL2 (physical layer comms primarily), it doesn't have any particular concern with the IP layer. That is where your router comes in. If it supports IPv6 then you're good to go - don't worry about the modem. My current setup is a small Linux server that runs PPPoE through an ADSL2+ SpeedTouch modem (configured in bridge mode). Are you essentially saying that the same PPPoE setup on Linux can be used, with BT's VDSL2 router plugged into it instead?